The global ADAS and autonomous driving components market generated $2.76 billion in 2016. The global ADAS and autonomous driving components market is largely driven by increase in the number of automated vehicles. Rising concerns associated with road safety, traffic congestion, and stringent governmental regulations have resulted in an increased demand of ADAS and autonomous driving components. Rising number of road accidents has resulted in increased regulations by federal authorities regarding the safety of both passengers and pedestrians. These guidelines have resulted in the rise in the demand for driver assistance features in vehicles such as adaptive cruise control, parking assistance, lane departure warning, and automated emergency braking, among others. The market in terms of value generated $2.76 billion in the year 2016, and is expected to grow at a rapid pace over the forecast period of 2017-2026. The research study is a compilation of various segmentations including market breakdown by component type, level of automation, vehicle type and different geographical regions. This report provides a detailed market analysis and forecast with respect to various component types in the ADAS and autonomous driving components market which are cameras, radars, ultrasonic sensors, LiDARs and ECUs. Additionally, on the basis of automation level, the ADAS and autonomous driving components market is segmented into level 1, level 2, level 3, level 4 and level 5 automation. While highlighting the key driving and restraining forces for this market, the report also provides a detailed study of the different vehicle type, which include passenger cars and commercial vehicles (light commercial vehicles, heavy trucks and heavy buses). • What the global ADAS and autonomous driving components market size is in terms of value from 2016-2026? • Which component type is dominating the global ADAS and autonomous driving components market in terms of value? • What is the revenue generated by the different automation level in the global ADAS and autonomous driving components market from 2016-2026? • Which vehicle type in the ADAS and autonomous driving components market is expected to grow the fastest from 2016-2026? • What are the different factors driving the market forward during the forecast period? • What are the major factors challenging the growth of the global ADAS and autonomous driving components market? • Which type of new strategies are being adopted by the existing market players to make a mark in the industry? • Which region will lead the global ADAS and autonomous driving components market by the end of the forecast period? • What is the market share of leading component manufacturers in the year 2016? The report also includes an exhaustive analysis of the geographical split into North America (the U.S, Canada), Europe (Germany, the U.K, France, Others), Asia-Pacific (China, Japan, South Korea, Others), Latin America, and Middle East & Africa. Each geographical region analysis details the individual push and pull forces in addition to the key players from that particular region. The report examines the role of the leading market players involved in the industry as well. The company profiles section includes highlights of significant information about the key companies involved along with their financial positions, key strategies & developmental activities of the recent years (2015-2017) and SWOT analysis of these players. Some of the key players in the ADAS and autonomous driving components market are ZF Friedrichshafen AG (Germany), Velodyne LiDAR (the U.S.), Magna International Inc. (Canada), NVIDIA Corporation (the U.S.), Robert Bosch GmbH (Germany), Continental AG (Germany), Delphi Automotive PLC (the U.K), Denso Corporation (Japan), Infineon Technologies AG (Germany), and Analog Devices, Inc. (the U.S). 9.12 Murata Manufacturing Co. Ltd. In the past years, automobiles have undergone rapid technological advancements in terms of vehicle performance, passenger safety, communication capabilities and driving comfort. This progression of automotive industry is largely attributed to the changing consumer preferences, growing focus towards driver safety, environmental concerns, and stringent governmental regulations which are focusing towards crash avoidance rather than crash survival. Improvements in automobiles have led to a surge in the number of on-road vehicles, thus raising the need for the safer movement of automobiles. At present, automotive industry is on the crest of technological advancement, wherein automakers are focusing towards increasing the road safety and achieving the goal of crash avoidance. These goals of automakers are profoundly supported by several federal authorities which in turn, is expected to advance the vehicle safety on public roads and an early integration of Advanced Driver Assist Systems (ADAS) in automobiles. Considering ADAS as the founding stone, automakers are expected to advance to semi-autonomous vehicles and ultimately, towards fully-autonomous vehicles. The report defines and estimates the market size and future growth potential of ADAS and autonomous driving components market during the forecast period (2017 to 2026). The global ADAS and autonomous driving components market generated $2.76 billion in 2016. The global ADAS and autonomous driving components market is largely driven by increase in the number of automated vehicles. In addition, stringent laws imposed by federal authorities mandating the use of autonomous systems in order to improve road safety and congestion are expected to drive the market at rapid pace. However, factors such as high sticker price of these components may limit the customer pool. Furthermore, high risk associated with the usage of autonomous vehicles and security concern’s towards vehicle data are challenges to be overcome for the growth of the market. On the other hand, the ADAS and autonomous driving components market offers extensive opportunities for the players in the semiconductor domain and due to lack of efficient sensors for autonomous vehicles, there are opportunities for the players to strengthen their market position. Radar held the maximum market share in 2016, due to its extensive usage in parking assist, adaptive cruise control and blindspot detection system in both passenger cars and commercial vehicles. However, LiDARs are still under the testing phase, but because of their high functionality, the market of LiDARs is expected to grow exponentially during the forecast period. In 2016, components market for level 1 automation held the maximum share. However, in the coming years, a shift in the market dominance may be witnessed, wherein, market for level 2 automated system components is anticipated to dominate the market by 2026. Increase in market penetration rate of higher level of automation (level 3, 4 and 5) in vehicles owing to the rise in concern towards driver safety will drive the components market for higher automation level at a rapid pace in the forecast period. ADAS and autonomous driving components market for passenger cars dominated the total market revenue in 2016 due to the high market penetration rate of autonomous system in passenger cars and lesser integration complexities as compared to the commercial vehicles. At the same time, the market for the commercial vehicles is expected to increase at a rapid pace, due to the focus of federal organizations such as European Commission, and Ministry of Land, Infrastructure, Transport and Tourism (MLIT) on decreasing road accidents and mandating ADAS features in commercial vehicles. The report also covers the global ADAS and autonomous driving market by geography and consequently provides the revenue of the key regions which include North America, Europe, Asia-Pacific (APAC), Middle East & Africa, and Latin America. Due to the presence of several key automotive OEMs and sensor components manufacturers, Europe held the maximum market share for the year 2016. This market dominance is expected to follow during the forecast period. On the other hand, the market for North America is anticipated to grow at the highest pace and is expected to hold the second largest market share by 2026. 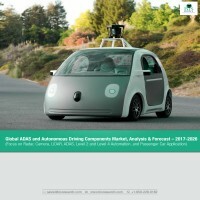 Some of the key players in the ADAS and autonomous driving components market are ZF Friedrichshafen AG (Germany), Velodyne LiDAR (the U.S.), Magna International Inc. (Canada), NVIDIA Corporation (the U.S.), Robert Bosch GmbH (Germany), Continental AG (Germany), Delphi Automotive PLC (the U.K), Denso Corporation (Japan), Infineon Technologies AG (Germany), and Analog Devices, Inc. (the U.S.). These companies are aiming for a wider range of product portfolio and collaborations in order to enhance the performance and quality of the components of autonomous systems.